Cartilaginous fish are a group of vertebrates consisting of fish such as sharks and rays, which belong to the taxonomic class Chondrichthyes. Cartilage is the flexible material that we have in our nose and ears instead of bones. For animals in class Chondrichthyes, their entire skeleton is made up of this material. Only their teeth and sometimes the vertebrae have calcium. These animals are very good predators, and sometimes wrongly thought of as man eaters. In sharks, the pectoral fins act most like the diving planes on the sub. They can twist them in order to change the angle of the head and therefore go up or down. In rays, the pectoral fins are very flexible and are connected to the head. They move the fins back and forth to move themselves forward. The manta rays which are the really huge, beastly, mid-water rays have a novel limb. Embryonically, part of the pectoral fin breaks off and moves forward such that they surround the mouth. These structures are called cephalic fins and help direct plankton (which they eat) into the mouths of these rays. The pelvic fins act similarly to protect the pectorals in the shark, they have taken on the secondary trait of being intromittent organs in male Chondrichthyes. Internal fertilization is universal in chondrichthyes fishes and, as such, requires a suite of biological activities, including behavioral, morphological and physiological mechanisms, to ensure successful copulation and fertilization. Chondrichthyes all produce a small number of offspring through either live birth or by laying eggs. Oviparous: The female lays eggs that develop over a period of a few months. Young hatch at sea and are on their own. Ovoviviparous: The eggs are hatched in the oviduct of the female. The embryos develop in the uterus until fully grown. Then they are released into the sea. Viviparous: The embryo is nourished inside of the female by a placenta. The gestation period lasts almost a year before the newborn is released. Many sharks are predators on fish, squid, and marine mammals, although very few are dangerous to humans. However, other cartilaginous fishes, such as skates, rays, and chimaeras, live on crustaceans and mollusks; they lack the knifelike teeth of predatory sharks, and their teeth take the form of big crushing plates. 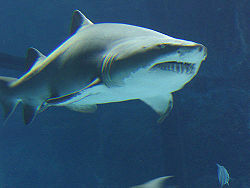 It may come as a surprise that several large sharks, like the basking shark, have small teeth and feed on plankton. As they swim in the open ocean, water is taken in through the mouth and strained through the gill slits. The largest shark of all, the whale shark, is a plankton feeder also. This page was last modified on 31 May 2016, at 15:50.